All human beings are created in the name of joy and happiness, but thousands of troubles surround us, tormenting us with sadness. If a person cannot see beauty in the world around them, then troubles and sadness tie them down. The beauty of the clouds floating in the sky, the beauty of the spring rain, the beauty of flowers, the beauty of friendship and love. May people see that beauty. May true humanity spread out in human hearts; may we all get our daily bread; may people forgive each other their trespasses and not bring each other into temptation through hatred. May peace spread out across all the Earth. Amen. for those ideals I hold most great and holy. in my soul, which remains both quiet and lowly. 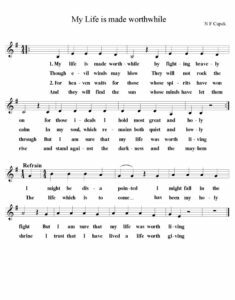 but I am sure that my life was worth living. I trust that I have lived a life worth giving. and stand against the darkness and the mayhem. Article about the history of Flower Communion by Petr Samojský. Available here in pdf format. 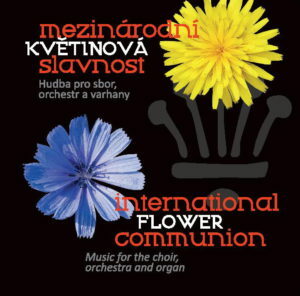 CD recording of special music for Flower Communion for choir, orchestra and organ. Written by the Czech composer Karel Loula. Listening to this music one is taken through time to the days when the Czech Unitarian movement started. Available for purchase at the e-shop.